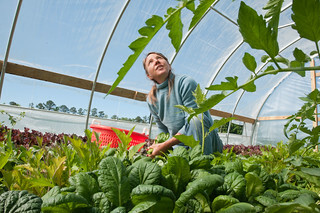 Amy's Organic Garden in Charles City, VA, on Thursday, May 5, 2011. Owner Amy Hicks harvesting greens at her farm. Ms. Hicks' farm participates with Fall Line Farms a local food cooperative in the Richmond, VA area that offers a wide variety of household food staples and specialty items on an ever changing inventory of fruits, vegetables, meats, soaps, eggs, cheeses, flowers, honey, pastas, sauces, syrups, baked goods, mushrooms, flour and grains. Suppliers post what they have on a Lulus Local Food online listing and customers can make their selection. Every Thursday suppliers deliver orders to, one of several pick-up points, designated by the customers in or around the Richmond area. USDA Photos by Lance Cheung.